Visitors have accessed this post 82928 times. 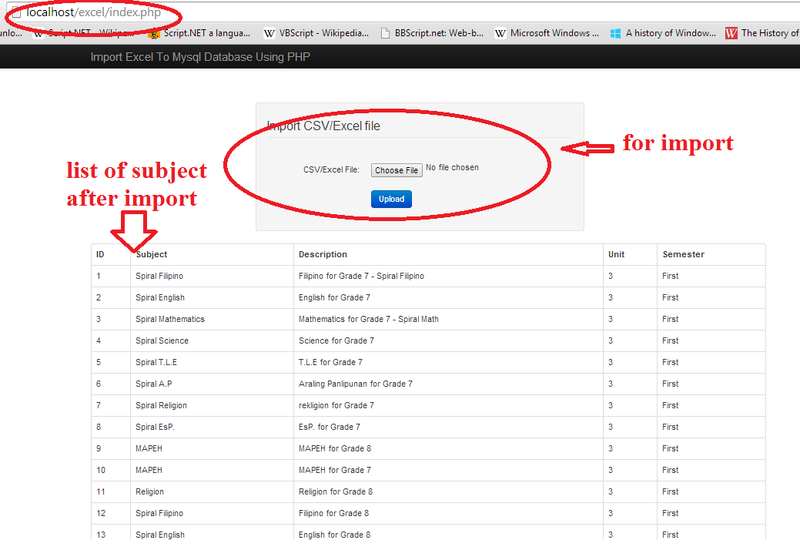 In this tutorial im going to show you how to create n application that can be used to import CSV/Excel file using PHP. To start with this project create a Database in your phpmyadmin named “studentdb” then execute this SQL query to create a new table called subject. Next create another PHP file named “index.php”,and this php file will be the first page that will load to our browser when we access the “excel” folder from our web directory. And this index.php will load all the list of subject if the subject table is not empty as well as this page will allow the user to import the CSV/Excel file and upload the data to MySQL Database. and it will look like as shown below. After this, you can try it with your own, and I have attached with this sourcecode the example csv/excel file used for this tutorial. By the way in this application I am using the twitter bootstrap framework, you can download and use it like in this application. If you want to see some new Source Code or Application and Tutorials Just click here. it cannot upload csv file, it always says "Invalid File:Please Upload CSV File." what can i do pls help me. Muito obrigado deu tudo certo! Kept it nice and simple - very neat! Thank you sir for your indirect help! But I have the csv in diferent a diferent style. I have in first row all the values for first column, and in the second row the values of the second colum. How I can cross this values? Thank you Joken, Do you have some tricks on how to customize importing text file (TXT) to database?? Thank you very much, that was all I needed for my project. Wishing you much success! i have problem my language when i improt execl with my language Vietnamese .it corrupted font. can you hel me about it ? in the same code, how can we put an update function? Do you have some tricks on how to customize importing csv file to database? I adjusted the file to my needs (db connection, tables etc). It worked at first, yet it only uploaded a small part of my CSV. Now when I upload, it states that it doesn't recognize any CSV file (while i'm uploading one unedited). Any idea's? hello, you might solve the problem? I have the same problem and I could not fix it.